Swiss students have created a walking and hopping SpaceBok robot that is being tested in ESA’s Mars Yard. The European Space Agency is an intergovernmental organization of 22 member states dedicated to the exploration of space. Established in 1975 and headquartered in Paris, France, ESA has a worldwide staff of about 2,000 and an annual budget of about €5.25 billion / US$5.77 billion (2016). 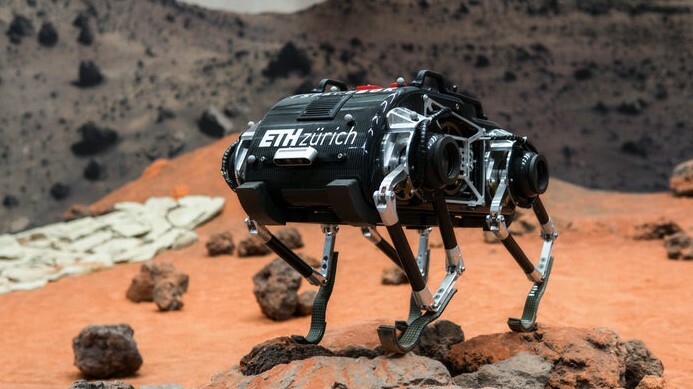 SpaceBok is a quadruped robot designed by a Swiss student team from ETH Zurich and ZHAW Zurich, under the supervision of Professor Marco Hutter and PhD student Hendrik Kolvenbach, for future missions to the Moon or Mars. According to spacebok.ch “Legged robotics with all its advantages can be used in space to improve the exploration of the Moon or Mars. In low gravity environments hopping proves to be energetically more efficient than walking. Our aim is to build a jumping robot capable of overcoming large obstacles and thus increase the operation range of mobile robots for data collection”. “We are currently implementing and testing vision sensors, to increase SpaceBok’s autonomy and robustness,” says team member Radek Zenkl. Suggesting you to watch the video below! Previous Previous post: What Is the Reason That Venus Is So Bright?